"The Munich-based surgical robotic startup medineering announced the release of a research edition of its intelligent medineering-arm. The arm is part of the company’s robotic portfolio and is now available for research institutes. The medineering-arm is a passive system with the intelligence and sensor technology only known of high end robotic arms. In contrast to common industrial robots the motorized movements can be reduced to robotic hands to perfectly address the needs of minimally invasive surgery – precise, delicate and safe movements provided directly at the surgical instrument. The arm is used as a smart positioning device for robotic hands. Having all controllers, sensors and circuits integrated inside the arm, it is a fully embedded system, powered by an external 24 V medical grade power supply. Robots and adapters can be attached via a mechatronic interface at its distal end within seconds. The interface provides a power supply, access to the internal communication of the arm and to external devices via the arm’s base to support and control attached robots. Additionally, a WLAN and Bluetooth module allows wireless communication. The medineering-arm is mounted directly to the OR table via an integrated adapter. With the RESTful API, researchers get access to all sensors and interaction modalities of the arm. 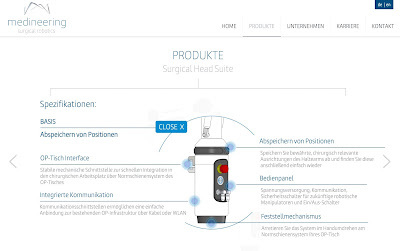 medineering, headquartered in Seefeld (Munich) develops, manufactures and markets a modular robotic portfolio, establishing new ways in minimally-invasive surgery. 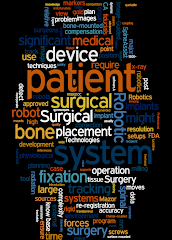 The portfolio consists of an intelligent holding arm and small application specific robotic hands assisting surgeons in areas of limited space. The first robotic hand will be a guidance system for ENT-surgery. 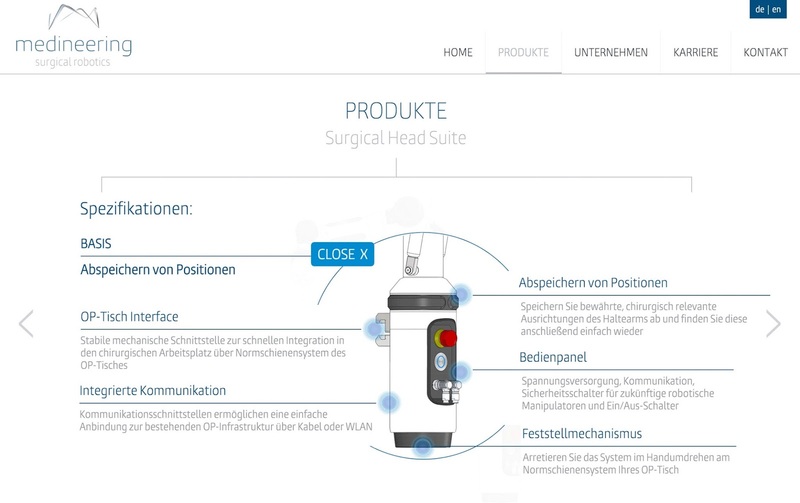 medineering was founded in June 2014 by Dr. Maximilian Krinninger and Dr. Stephan Nowatschin. The startup has grown rapidly and the young and international team consists of highly specialized robotic engineers, marketing experts and regulatory specialists." Looking for a job? They are hiring!